President Juan Manuel Santos and the leaders of the FARC, the Revolutionary Armed Forces of Colombia, signed a peace deal on November 24, 2016. Has the goal been achieved? 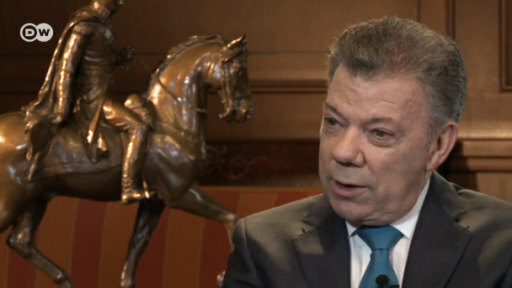 ​A year after he signed a peace deal with the Revolutionary Armed Forces of Colombia (FARC), President Juan Manuel Santos used his thank you speech as he received the Chatham House Prize in London in early November to reassert the international community Colombia's obligation to fulfill the agreement. While the audience applauded the remark, Colombians wondered how much higher the cost of peace would be. "Ex-guerrilla fighters are being released from prison but without their legal situation resolved, finding a job is almost impossible. Many of them don't have enough money to pay for rent, or a family they can rely on," says Daniela Sanclemente, legal advisor to the Secretary General of the Special Jurisdiction for Peace (SJP). 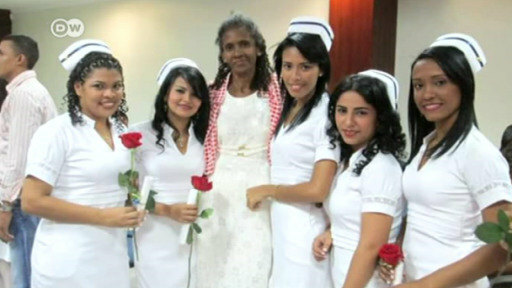 She has been visiting prisons and collecting background information on the former members of the FARC who will be tried by the system of transitional justice. "Their biggest fear is the uncertainty of their situation." The peace agreement has been hanging by a thread for months. The bill that determined how the SJP – the deal's backbone – will function was stalled in Congress. Lawmakers were taking advantage of the government's urgency to put the SJP in motion. Even the members of Santos's party were refusing to vote without something in exchange. The currency was jobs in public offices, political alliances and investments in infrastructure for their regions. Without the SJP the country's reinstatement process, which would integrate guerrilla members into society, is in limbo. As part of a deal that would end a conflict of more than 50 years, the FARC and the government agreed to create a system of transitional justice. The former is made up of a Truth Commission, a Search Unit of Missing People, and the Special Jurisdiction for Peace. This autonomous system is in charge of constructing the truth and trying former FARC fighters as well as members of the armed forces and civilians who partook in the conflict. Absolute justice is impossible. On paper, the system of transitional justice can pardon or grant alternate ways of punishment – social work instead of prison – to the men and women who tell the truth from the start. The details of how the SJP will work remain uncertain. Having made some changes to the SJP – among them that former members of the FARC charged with sexual offenses against minors cannot be tried by the system of transitional justice – the Senate approved the bill last week. But before the mechanics of the SJP become law, the House of Representatives has to come to a decision. The deadline is November 30. The SJP's bill has been processed through a "fast track" created by the government to pass post-conflict related laws at a quicker pace. The "fast track" expires in seven days. If the bill has not passed by then, "the correct legal procedure is to begin from scratch, because it has been dealt with through an extraordinary mechanism that expired," says Carlos Lasprilla, a professor of constitutional law at Bogota's Pontificia Universidad Javeriana. Meanwhile former FARC leader Rodrigo Londono, aka Timochenko, announced his candidacy for the 2018 presidential elections, and 11 ex-FARC fighters are running for Congress next year too. The peace agreement states they get five seats in the Senate and five in the House of Representatives regardless of the voting results. The prospect of justice not being served angers Colombians. Their worries grew after the government presented a bill benefiting members of criminal gangs who surrender their arms. Eighty percent of their sentences would be reduced and they could keep five percent of their illegal earnings. The country's criminal justice system would be practically dissolved. For months criminal groups have been recruiting ex-guerrilla members to gain power over drug trafficking, and violence in the country's peripheral regions has skyrocketed. In 2017, 120 human rights advocates were killed. Lawmakers, former Supreme Court justices and even the former anti-corruption prosecutor are involved in corruption scandals, and with the recent tax reform, investment rates are declining. "The justice system was left without rules because the SJP changed them," wrote columnist Juan Lozano in El Tiempo newspaper last week. "Yet there is no SJP because the bill that sets it in motion has not been passed." The current state of uncertainty has heightened the country's polarization. A year after the peace agreement was signed, violence is increasing and reconciliation seems like an insurmountable task. Human rights organizations say 500 social activists have been killed in Colombia since 2016. Activists say police do not investigate properly when NGO workers are threatened. DW's Javier Arguedas with a report from the province of Santa Marta.